Wednesday 7th September Australian Market Wrap | Beeks Downunder-Because not all financial news is boring! ASX 200 rises 11 points to 5424 as GDP fails to move the dial. Gold stocks and banks help keep market positive after flirting with a negative day at lunch. Asian markets mixed as Japan slips 0.41% and China squeezing higher by 0.32%. AUD shrugs off GDP print rising to 76.72c and US Futures flat. Gold! Gold! Gold! for Australia today with the bullion price rise driving miners higher. Saracen Minerals (SAR) +11.48% also added to the bull case with some good drilling results today. Once again the leverage of the sector highlighted with Oceanagold (OGC) +8.50% and Northern Star (NST) +8.13%. Other resources failed to follow through with BHP +0.29%, Fortescue Metals (FMG) -3.48% and RIO -0.76% all weaker after record iron ore exports. Base metal company Independence Group (IGO) +4.29% had a good day following a substantial shareholder notice. Energy stocks weaker with Santos (STO) -4.98% the standout following the monthly drilling report update. Coal stocks weaker on profit taking with Whitehaven Coal (WHC) -2.76% though Stanmore Coal (SMR) +2.11%. Banks have become the new REIT market as investors continue to switch and swap between the four trying to eke out relative performance. Westpac (WBC) +1.62% in demand today as was Commonwealth Bank (CBA) +1.11%. The REIT sector was again under a cloud given potential rate cuts are off the table following the GDP number. The sector has run hard and inevitably we would see some profit taking. GPT—2.72% and Stockland (SGP) -1.89%. Other interest rate sensitive stocks also continue to track sideways at best with Sydney Airport (SYD) +0.57%, Transurban (TCL) +0.45% and AGL Energy (AGL) -0.44%. A reversal of fortunes today for aged care, the most volatile sector in the market this week. News that the government will review its decision on funding was welcomed by punters pushing Estia Health (EHE) +9.90%, Regis Healthcare (REG) +1.31% and Japara Healthcare (JHC) +4.88%. Food and health stocks were back in demand A2Milk (A2M) +7.69% was especially strong. BWX +5.02% back in favour too as was Blackmores (BKL) +3.08%. Speculative stock of the day: Xped Limited (XPE) +14.29% following board and management changes with vendors agreeing to cancel existing performance shares for nil consideration. Select Harvest (SHV) +3.96% after a crop update showing the bees are buzzing with 33,000 hives now located in the almond orchards with strong tree flowering and good weather conditions for bee flight hours. Good news indeed. Saracen Minerals (SAR) +11.48% updated the market on the current drilling at the King of the Hills project being a satellite feed to Thunderbox. 14.3m at 21.2g/t and other results from Karari showing 24m at 5.4g/t. Oceanagold Corp (OGC) +8.50% announced robust economics from Haile preliminary underground study. Estimated LOM AISC of US$554 with open pit and incremental underground gold mining. GDP grew a solid 0.5% in the second quarter and 3.3% over the year, its fastest pace of annual growth in four years. Economists on average tipped quarterly growth of 0.6% and annual growth of 3.3%. 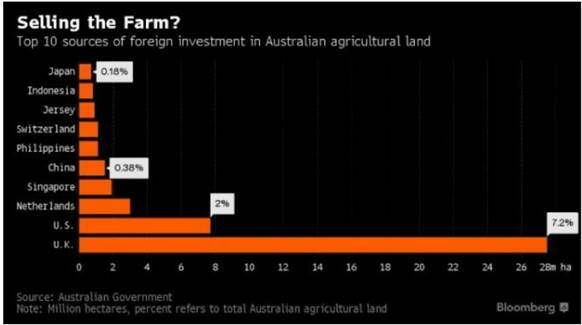 According to the newly created Agricultural Land Register, Chinese investors hold just 0.38% of Australia’s agricultural land. The treasurer released the report which he said will allay concern among voters that the Chinese are buying up farmland on a massive scale. A total of 13.6% of agricultural land is held by international investors, with 52% of that owned by UK investors. Jersey seems to be a big investor in our land. Apartment prices in Sydney and Melbourne will fall 15-20% over the next two years, according to AMP Capital’s chief economist Shane Oliver. He said a slump in the Australian housing market would be driven by a glut of supply rather than investors defaulting. Iron ore news: Exports from the terminal in the Pilbara totalled 42.9m metric tons in August from 38.7m in July and 39.2m a year earlier. Cargoes to China were 35.4m tons, also an all-time high, from 32.5m in July and 33.9m in August 2015. 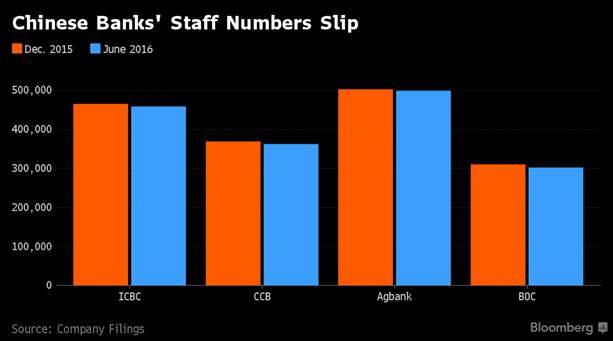 China’s four biggest banks reported that staff numbers fell by the most in at least six years in the first half with Agricultural Bank’s staff numbers slipping below 500,000. A new poll has found that Francois Hollande would be histoire with a run off for president between Marine Le Pen and Nicholas Sarkozy. The current leader would get 11% to 15% of the vote according to nine possible combinations of the various candidates, so says the poll by TNS Sofres-OnePoint. The fourth most powerful man at the Fed was out and about auditioning for Yellen’s job if Trump gets elected. John Williams from the San Francisco Fed painted an upbeat picture of the US economy in a speech. The economy is “in good shape and headed in the right direction,” he said. He went on to say “Every meeting is live, we want to have a serious discussion.” Bout time. Tonight is the big night for the launch of the new Apple products. iPhone 7 come on down and take a bow. A ship carrying red paint collided with another one carrying purple paint. Both crews are thought to be marooned! Melbourne police wish to alert local residents about the activities of the infamous cross-eyed burglar. If you see this man staring in your windows, warn the people next door.